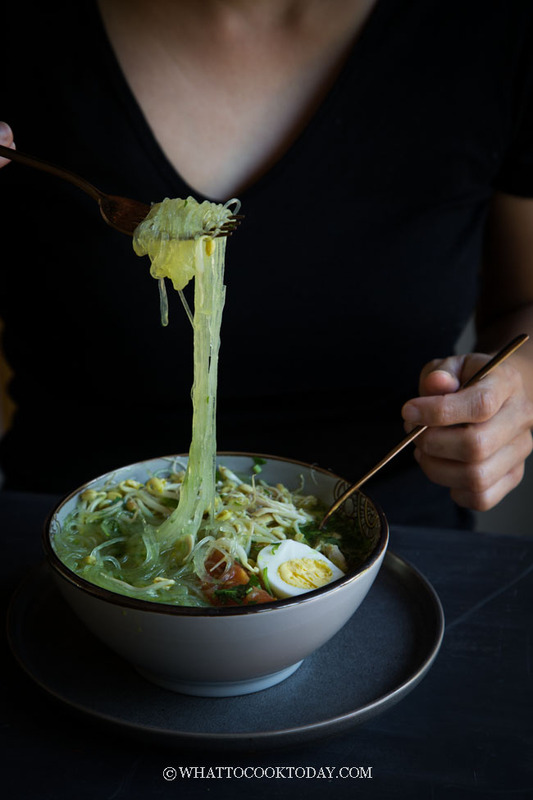 Soto Ayam Bening (Indonesian Clear Chicken Noodle Soup) – One of the delicious Indonesian soto (soup) made with chicken and aromatic spices and herbs and characterized by its clear soup, without coconut milk like other types of soto. Also known as Soto Ayam Lamongan. Can be made on stove-top or pressure cooker. Chicken soup is probably one of the soup that every country has its own version. 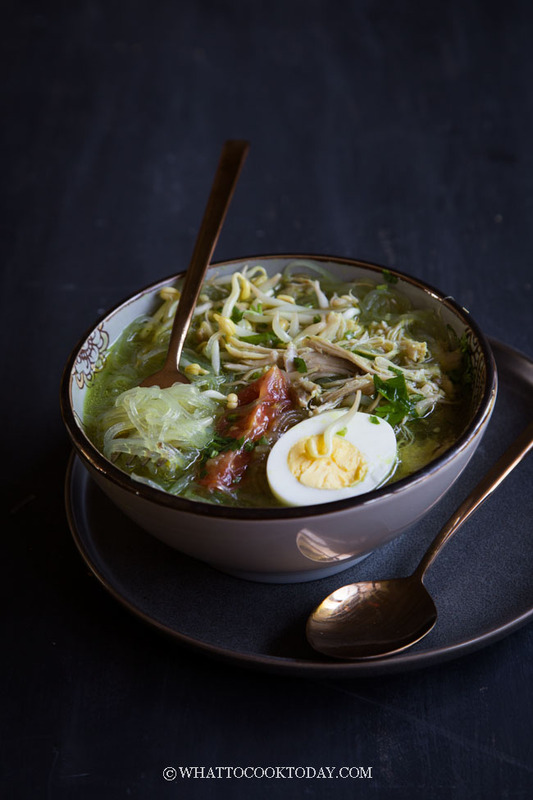 Soto is Indonesian version of soup, not necessarily chicken soup, but just soup in general. Soto can be made with meat, commonly beef and chicken in Indonesia. 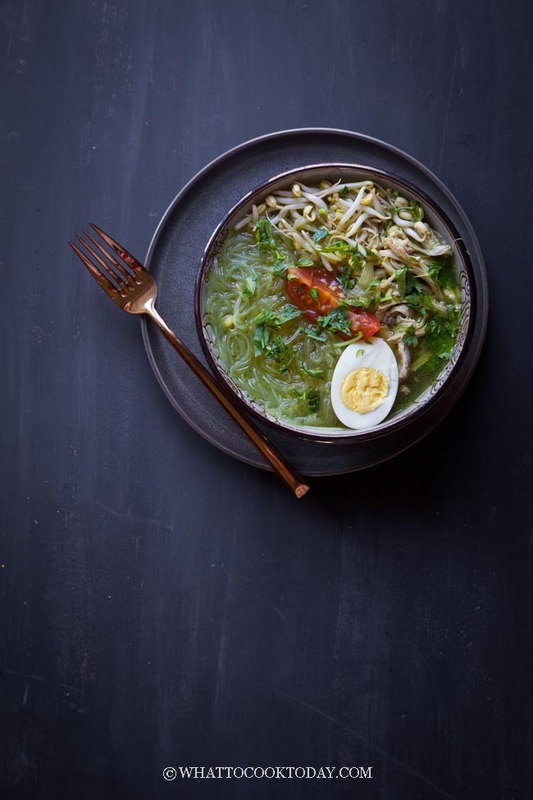 There are so many different types of soto throughout Indonesia. Spices and herbs used may not be drastically different. You will see some similarity in terms of spices and herbs used, but each has a certain thing that makes it special. 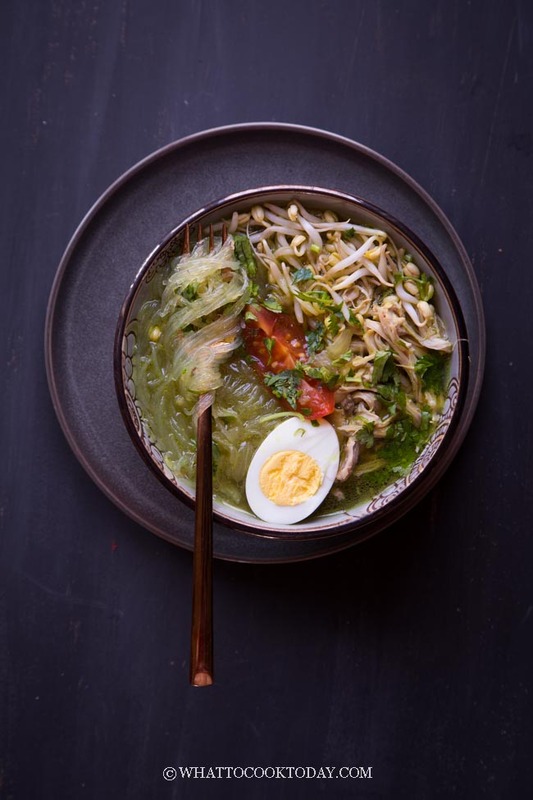 WHAT IS SOTO AYAM BENING? Soto means soup, ayam means chicken, and bening means clear. So, now you see where I got the English translation 🙂 It’s pretty straightforward. No coconut milk is added to the soup to make it creamy and that’s why it was named as such. 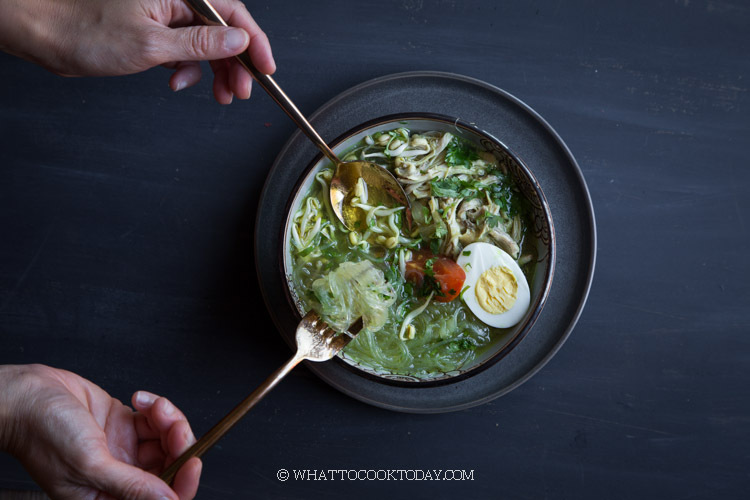 One of my favorite soto made with coconut milk is Soto Ayam Medan, from the hometown I was born and grew up. 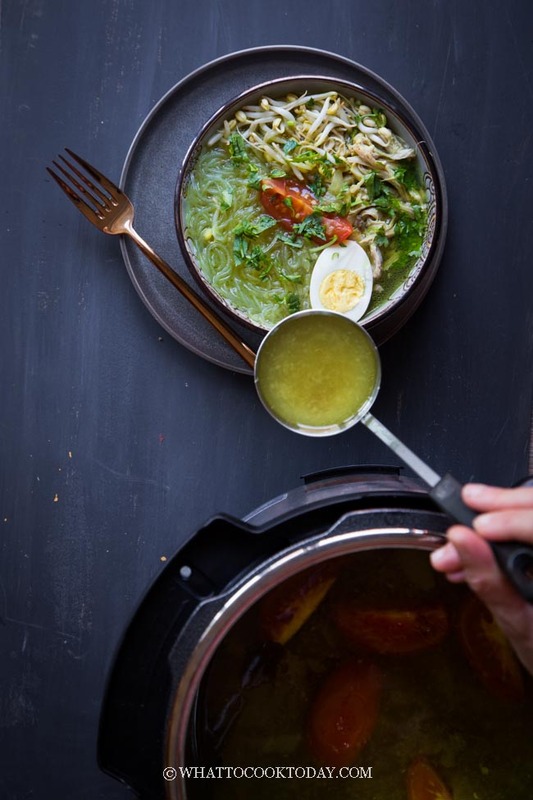 Despite the name soto ayam bening, the soup has a yellowish tinge to it because of turmeric. 4. You can even serve this with rice. In Indonesia, people tend to eat “double” carbs in one meal, in this case, they eat both the noodles and the rice. You can leave the noodles out and eat with rice. Leftover of soup and chicken can be kept in the refrigerator for up to 5 days. If you have plenty of leftover of soup, you can freeze them in individual jars or freezer-friendly containers for up to 3 months. Only shred the amount of chicken meat you think you will serve. Leave the rest whole, so when you store them in the refrigerator or freeze them, they won’t dry up too much. They can be freeze in freezer bag for up to 3 months too. Reheat the soup on stove until hot. You can put the chicken pieces in the soup briefly just to warm it up and then serve. For frozen chicken and soup, let the frozen chicken meat and soup thaw in the refrigerator and then heat the soup until boiling and shred them into a hot soup to reheat. 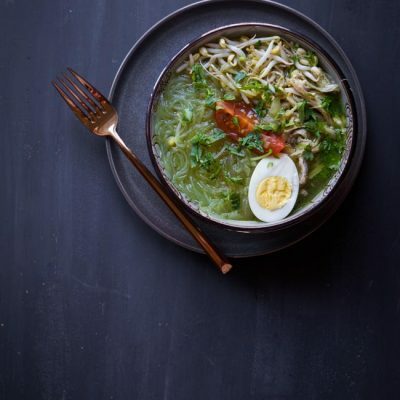 One of the delicious Indonesian soto (soup) made with chicken and aromatic spices and herbs and characterized by its clear soup, without coconut milk like other types of soto. Also known as Soto Ayam Lamongan. Can be made on stove-top or pressure cooker. If you feel like it, you can pan fry the chicken briefly until it forms some layer of skin and then shred the meat. This is totally optional. Otherwise, when the chicken is cool enough to handle, shred the meat. I’ve never had the Indonesian version of a chicken soup, it definitely looks and sounds delicious, so different than what we are used to here. I am definitely keeping this in mind.